Lil Wayne threatens Justin Bieber's manager Scooter Braun over Young Money artist Lil Twist. 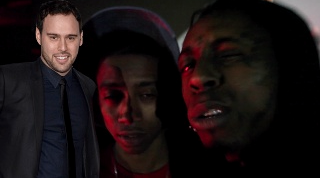 Lil Wayne had a message for Justin Bieber's manager Scooter Braun and it's full of expletives. Wayne took a jab at Scooter for bad mouthing his YMCMB artist Lil Twist who had built a reputation for being a bad influence on Bieber. Twist and Bieber used to be friends before they cut ties in 2013 following a series of run-ins with the law. Twist was often portrayed as a bad influence on Bieber in media and Wayne pointed out who the culprit was. "I heard this b***ha** ni**a Scooter talkin' s**t about my little brother," Weezy said in a video shot by DJ Scoob Doo and debuted on Bread Over Bed on Monday, May 26. "Ni**a, this my motherf***in' brother, anything you got to say, when you see me say it to my motherf***in' face," Weezy added. He continued talking with his hand wrapped around Twist's shoulder, "And if you do happen to say it to my motherf***in' face, I ain't gonna make you eat them words ni**a, I'ma put them b***hes on your tombstone." The rapper signed off with, "F**k you Scooter!" Back in November, Twist tried to clear his name by saying Scooter planted stories that made him look bad in order to retain Bieber's "squeaky clean image." Bieber and Scooter remained good friends with the pop singer posting an Instagram photo of them hugging and captioning it, "All love."